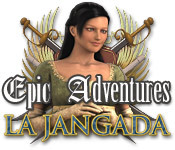 Download Epic Adventures: La Jangada Game FREE NOW! "Help Sam rescue his love Anna in Brink of Consciousness: Dorian Gray Syndrome, an incredible Hidden Object Puzzle Adventure game!" about Brink of Consciousness: Dorian Gray Syndrome Collector's Edition Game! Help Sam rescue his love Anna! Copyright (c) 2003-2011 by GamesChoco.com. All rigths reserved.